Alas for those who are gone but can never be forgotten. 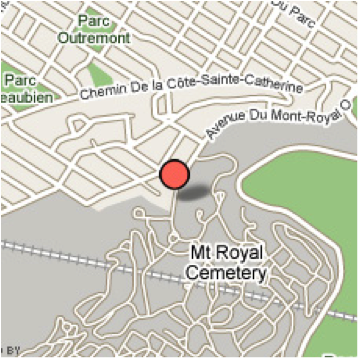 The Shaar Hashomayim Cemetery was established in the mid-1860s on the northern slope of historic Mount Royal. Dignified & beautiful grounds of the cemetery provide a sense of comfort to members in times of loss and remembrance. View our printable brochure about the Shaar Hashomayim Cemetery. Members of Shaar Hashomayim have the privilege of reserving plots in the Shaar Hasomayim Cemetery. Please contact the cemetery office for more details and to initiate this request. Funeral arrangements are handled by Paperman and Sons – 514-733-7101 or www.paperman.com. The placement of a monument and/or footstone can be arranged at any time after burial and traditionally it should be placed before the first anniversary of passing. A minimum six week period will be required to arrange for selection, ordering, engraving and delivery of a monument and/or footstone. Once the monument is ordered, the monument maker will coordinate with Yosi Even-Hen, Ritual Director, for verification of the Hebrew text and with the cemetery office for scheduling of the monument foundation and the installation. Click here for a list of monument makers who have installed monuments in the Shaar Cemetery. Please contact the Rabbi's office 514.937.9474 ext. 143 once you have made arrangements with the monument maker. She will coordinate the unveiling schedule with both clergy and cemetery staff. Please note that only unveilings scheduled through Brenda will have the monument covered in preparation for the unveiling ceremony. The Shaar Cemetery offers many options of flowers and landscaping choices to serve as dignified and beautiful tributes to the memory of loved ones. We also offer perpetual care programs that simplify the process of providing flower care over years. Please contact Stewart Leibovitch for more details. Please visit our Family Loss section.